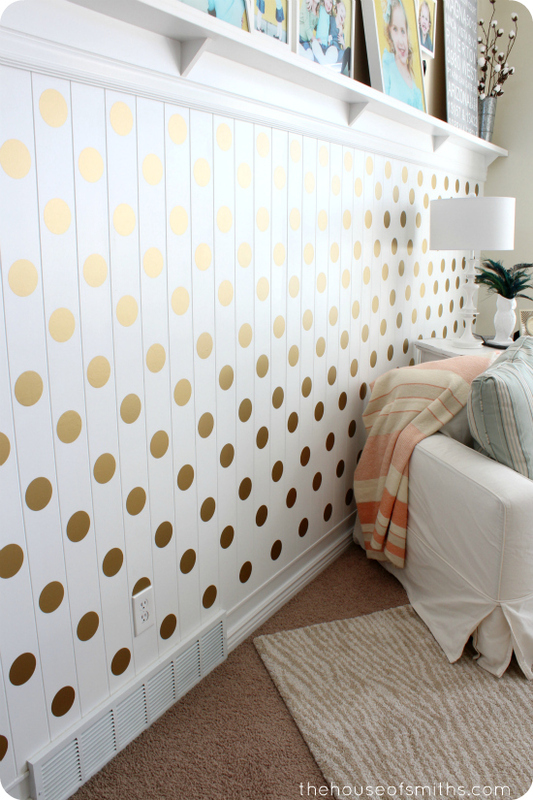 A Gold Polka Dot Accent Wall! The kids got to decorating their tree with Cason in the basement on Sunday, and have been talking Christmas ever since; I love it! I know that there are two types of people who are going to see this. Type #1 - "YAY! Christmas decorations, music and cheer! I'm so happy it's almost here!" Type #2 - "Seriously? Why don't these crazies wait till at least after Thanksgiving... I mean, that's a holiday too, jeesh!" Ha! I've already seen the backlash from other bloggers' posts about trees and Christmas decor, so I guess it's just inevitable... right? Some people do Christmas really early, while others have traditions of decorating trees the day after Thanksgiving. For us... we just start pulling out Christmas whenever we feel like it. There's never a specific date or time, but I DO tend to do things earlier than most, so I can share all (or as much as I can) of my ideas with our readers before THEY start really decorating... does this make sense? I guess it just comes with the "job", and to be honest, I actually love Christmas decor up during Thanksgiving. It always makes it feel more cozy, and just means that in the end, I get to relax and enjoy all my hard work and pretty stuff for that much longer! 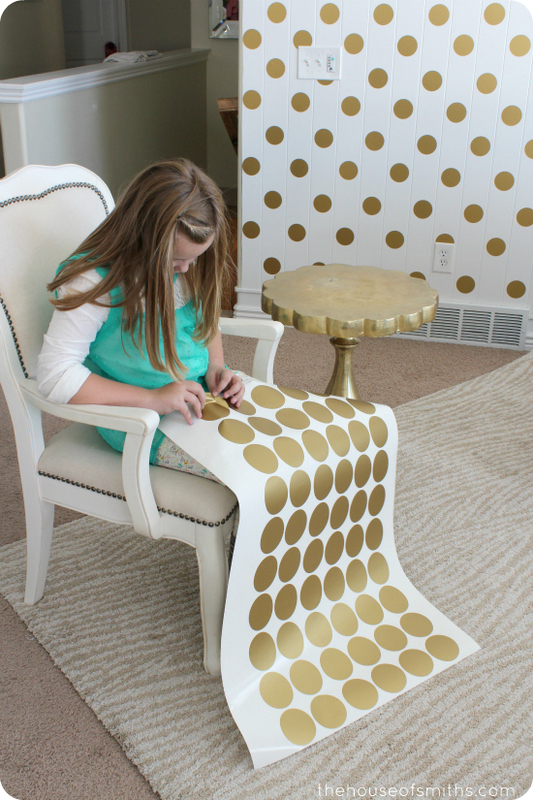 A GOLD POLKA DOT accent wall! whoohoo! 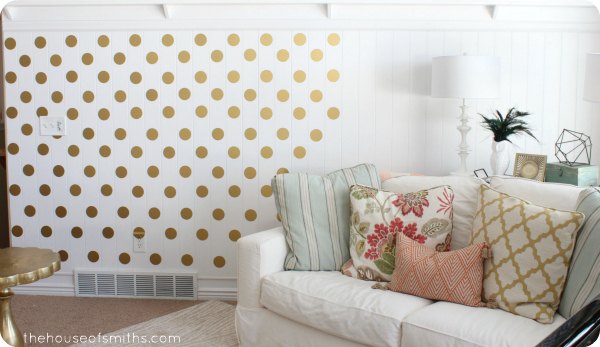 Our beadboard wall in the living room served as the perfect "grid" for free handing these polka dots. I had no patience for making perfectly straight lines or digging through tools out in the garage to find a laser level (or to discover after looking for 30 minutes that we don't even own one... because honestly at this very moment, I have no idea if we actually do or not), so I just eyeballed the polka dots placement. Obviously I chose gold for this project, but you can go with any color you want, we've made every shade available for purchase, so go nuts! 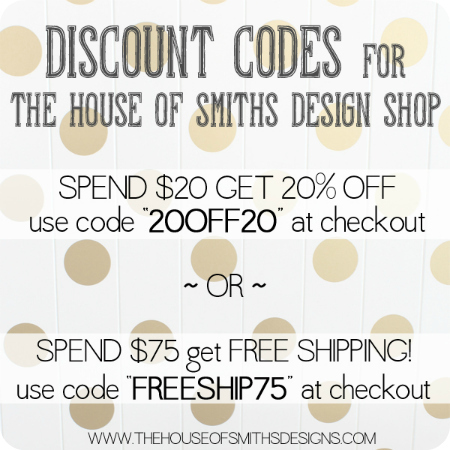 These 3 inch polka dot decals come in a 40 count set over in our House of Smiths Design Shop. We made the polka dots as user friendly as possible. No transfer tape to mess with, just peel off the high-quality vinyl, and place it where you want. When you're done, peel it off... the end! I did have Emberly as my little helper, because even though this technique moves really quickly, having someone hand you polka dots off the paper makes things go even faster. Our beadboard wall space measures about 13ft x 5ft and so according to the sheets we sell in our shop, we used 6 total. 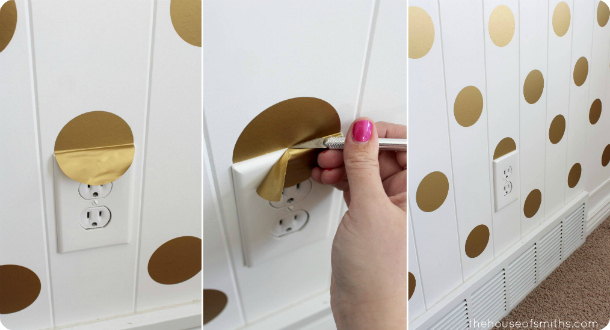 When I got to spots that had outlets or light switches I just simply cut around them with an x-acto knife. I LOVE that these decals look like wallpaper, yet only took about 25 minutes to apply. I know I put them up for Christmas, but I'm seriously loving them so much just with my everyday stuff! I'm excited to start implementing all of the little things I've gathered for my Christmas decor this year into my space. It's going to be a bit different than what some of you might expect, and actually. WAY different than what I had had in mind too... (more on that story later). For now, I'm just going to be playing with my new wall as much as I possibly can while it's here. 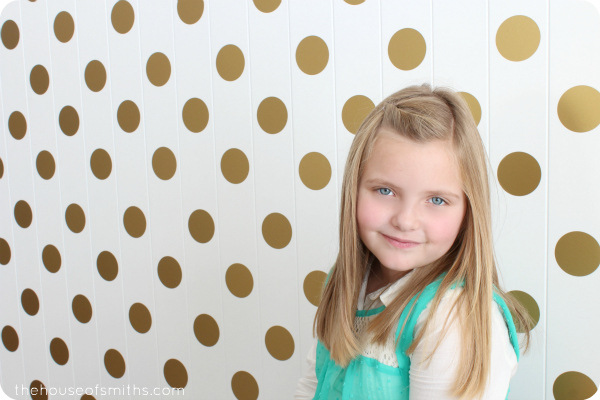 With yesterdays sunlight pouring in our windows, a white & gold polka dot backdrop and this angelic 7 year olds sweet face... I'm completely in Heaven. 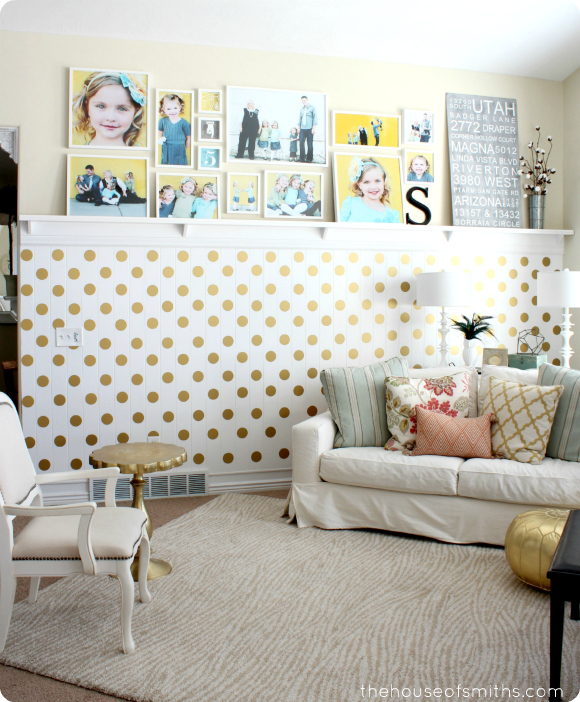 Your gold polka dot wall looks beautiful - love it!! The wall is so pretty! I'd love to do that to a wall in a nursery or deck out a little girl's closet like that one day. I'm with you on the Christmas front! We don't have thanksgiving here in the UK so my christmas decorations started going up on November 6th. Yes I'm one of THOSE people! How many sheets did you use in this project? I LOVE it Shelley!! 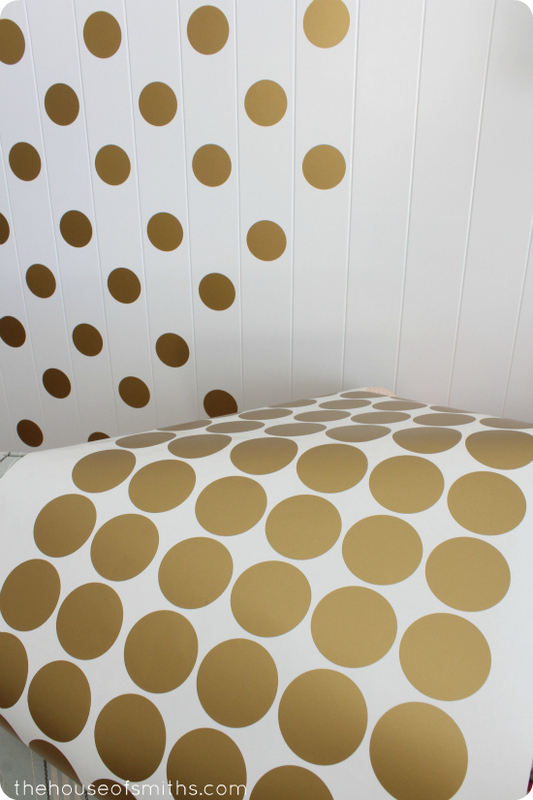 I bought some gold polka dots for my office just the other day, I haven't decided how I want to put them up yet.....I LOVE how yours turned out!! I'm loving the polka dots! How fun! I love that they are vinyl and can come off to! Great project! Love it! And where did you get that cute rug?! That is very cool! 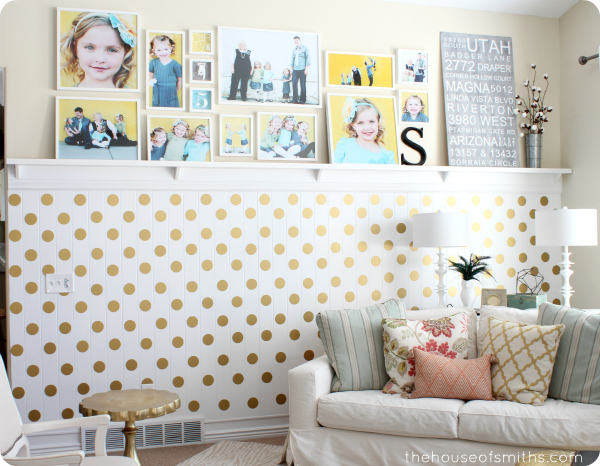 I love polka dots and they look great on the wall! I am the lets bring out the Christmas decor in July, if I could person, so I will start the slow clap that you brought yours out before Thanksgiving. I have 8, yes 8 trees so since I am hosting Thanksgiving this year I am waiting until the day after Thanksgiving to put it all up!! I'm so excited! I love your polka dot accent wall! I think this is the first time I've ever commented on your blog but I love your style and I know this blog takes allot of work but we really appreciate it!! Oh my goodness! The decals are positively unexpected - but PERFECT!!!! You guys are always my most favorite! It puts a happy smile on my face... Absolutely love it! LOVE this! I've been wanting to do this in my daughter's room. 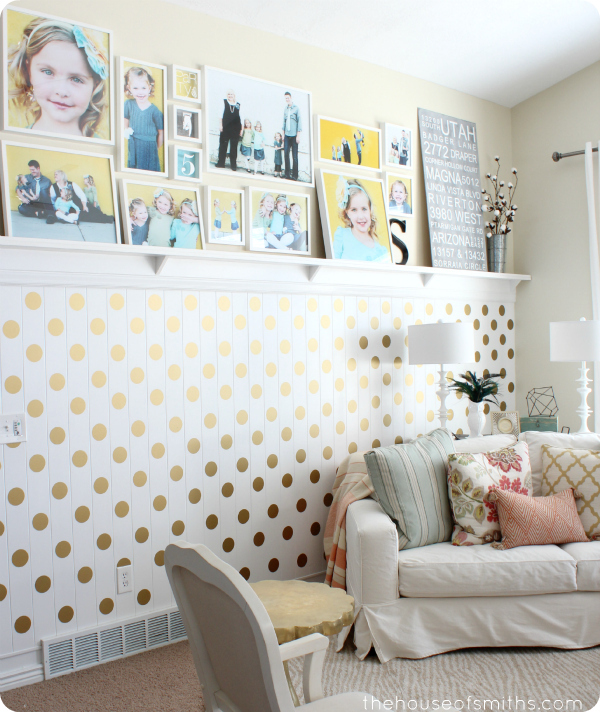 Could you give us the dimensions of your wall, and an idea of how many polka dots you used? beautiful! i love polka dots! I'm obsessed with this wall!!! May have to do this in our new home. Darling girls mean darling ideas! That wall just makes me happy ... super cute! Oh my goodness, I can't believe people get upset about the decorations other people are putting up in their own homes! Really!!! It's just so crazy. For the first time ever last year, we totally dragged our feet with Christmas decorations - first we had a tree with just lights for several days, and then with just my "theme" decorations for a couple of weeks, and finally on Christmas eve we put up all of our traditional ornaments. It was actually really fun to keep changing the tree, and the final decorations were a terrific addition to our Christmas eve. On a different note: THOSE POLKA DOTS LOOK SO GREAT!!! I can't wait to see all the rest of your Christmas decor!! WOW, I thought they were wall paper. Beautiful job! Adorable Shelley! 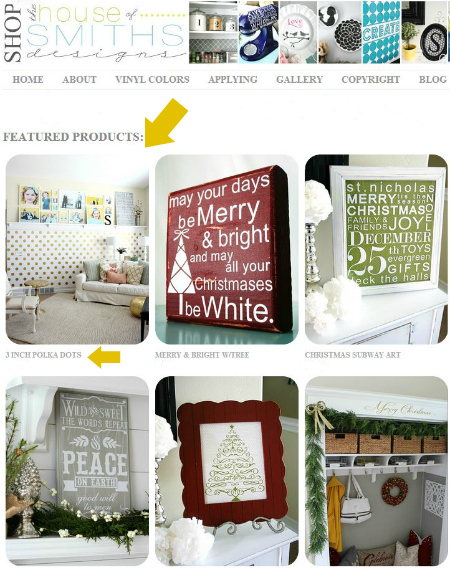 Can't wait to see your Christmas decor! It's always on e of my favorites! This is the best thing ever. I love gold and am so happy it is back "in style" it is so classic but the polka dots are so fun! I would leave them indefinitely. They are too cute for just a few weeks a year! How fun. That did end up as a great backdrop for your gorgeous daughter's pic. You are just so stinkin fun and creative. If I ever make it up there I would LOVE to meet you. You are one of my favorite blogs, an inspiration to me (more than you would probably realize), and you just seem fun! Keep on Keepin On! I love the gold dots!! What a great idea! love the dots. could you share the source for the rug. love that too. so fun. would you share a source for the rug? Love love love the dots! It looks like wrapping paper! How many sheets did you use? Also, I am a after Thanksgiving girl for Christmas but I so understand the temptation. 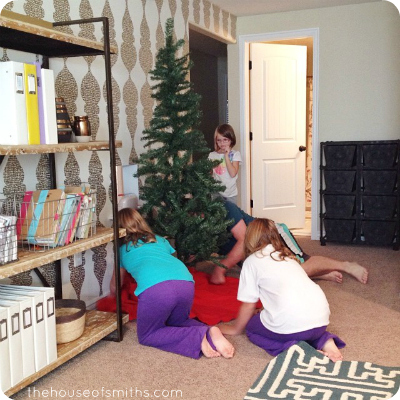 Christmas decor is fun and makes your house look magical! I say whatever floats your boat! Sorry, Reread your post! She used 6 sheets, people! I love the narrow shelf on the wall. Looks very easy to make. Good source of wood is IKEA (bed slats). It gives a room a bit of texture.